Oh, please do give the wonderful Mr. Pratchett another chance - the Discworld novels are what I fall back on every time I need to lighten my mood and read something that's just plain fun. There are some weak spots (to be expected in such a long list of books), but some absolutely stellar reads as well. 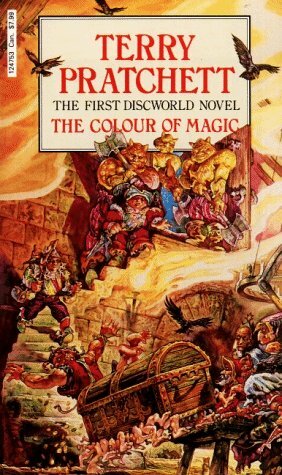 I tried to read the Colour of Magic a while back and I actually gave up halfway through. I have been told afterwards though that it is not the best of his books and that I should just move on in the series and read the others. You aren't alone. I definitely felt like I was missing what everyone else was getting. The only thing I remember getting out of it was thinking it would be cool to have one of those suitcase things. Thanks for the encouragement... I have high hopes for Mort! I'm sooooo glad I'm not alone!!! I've read a lot of Terry Pratchett, but haven't delved into this one yet. Hmm....I think waiting a bit longer won't hurt! I know how you feel! I was disappointed too, but whether it was in the book because it wasn't really funny or in me because I didn't find it very funny, I'm not sure. I did go on to read another couple of the Discworld books and I'm happy to say I found them getting increasingly better. I have a few more sitting on my shelves that I will pick up when the mood strikes me. BTW, have you read Good Omens by Pratchett and Gaiman? Hilarious.